This map highlights (red oval) the study area for a potential wind farm offshore Morro Bay, California. 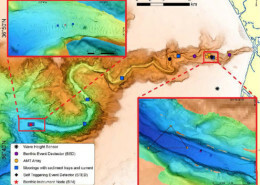 Expedition goal: Investigate the activity of submarine channels, gullies, and pockmarks as well as begin conducting post-lay impacts of submarine telecommunications cables. The cruise will be focused in a large area offshore Morro Bay, California, where a potential wind farm is being considered. The wind farm will have up to 100 floating wind turbines more than 100 meters tall. The turbines will be anchored to the seafloor in more than 500 meters water depth and will connect into the electric power grid with submarine cables. This area is targeted for two reasons: due to the availability of an existing power distribution system onshore, which is currently fed by Morro Bay and Diablo Canyon power plants, but will be left underutilized when these plants are decommissioned; and its favorable average wind speeds. Presently, very little is known about the conditions on the seafloor in this area. In fact, much of the area has only been sparsely mapped with multibeam systems at low resolution. Clearly, before any decision can be made about the environmental impact of such a facility, this knowledge gap needs to be filled. MBARI is now participating in a collaborative effort involving the Bureau of Ocean Energy Management, the US Geological Survey, and the National Oceanic and Atmospheric Administration to rectify this knowledge gap. Our initial goal is to conduct basic observational studies to document the tectonic setting, sedimentation rates, morphological features, and seafloor texture. We will also begin conducting studies of post-lay impacts of submarine telecommunications cables. During this cruise, we completed 12 ROV dives, collected 49 vibracores, and 201 push cores. The length of these samples total 11,215 centimeters of sediment cores. Of that, we sliced, bagged, and labeled over 4,009 one-centimeter slices of mud. We hope these muddy samples can shed some light on how these features were formed. This video is a fun (and speedy) depiction of a day in the life of marine geologists, collecting and processing cores, on the R/V Western Flyer during this expedition. Video edited and produced by Natasha Chapplow (MBARI collaborator, Durham University). What can we learn from sampling the seafloor and how do we do it? 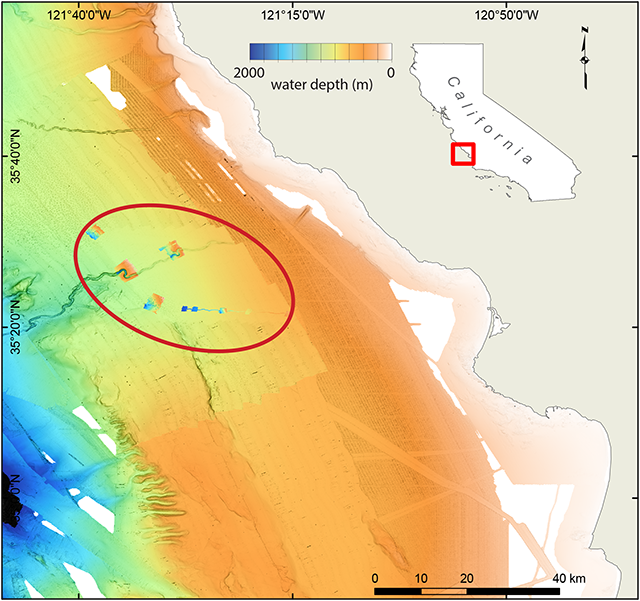 On this cruise, we are studying the processes that modify the seafloor in an area offshore Morro Bay, where a wind farm may be located in the future. The environmental conditions and stability of the seafloor are important factors to consider when evaluating how this infrastructure will impact the seafloor. Sediment slowly accumulates over geologic time and blankets the seafloor. Seafloor currents also modify these accumulations, eroding sediments in some areas and depositing them in others. Sediment avalanches or submarine landslides can occur as rapid events that change the seafloor considerably, producing scars and channels. In addition, where submarine springs or natural gas vents occur, they may produce depressions called pockmarks over time scales of decades to thousands of years that shape and modify the seafloor morphology. These faster processes need to be considered as potential hazards to any seafloor infrastructure. To better understand them and how they may affect any structures placed on the seafloor, we collect long vertical core samples that give us insight into the processes occurring in this environment. MBARI’s remotely operated vehicle (ROV) pilots perform the collection of sediment cores. The pilots use their expert skills to carefully operate the ROV manipulator arms to collect two types of cores: push cores and vibracores. Push cores are 25-centimeter-long clear tubes that are pushed into the sediment with the manipulator arm of the ROV. The vibracores are collected with a vibracoring system mounted on the front of the ROV Doc Ricketts. This device inserts 1.7-meter-long aluminum tubes into the sediment. The insertion is aided by the activation of a powerful vibrating motor atop the tube that induces high-frequency vibrations of the tube walls. These vibrations liquefy the sediment directly around the tube and enable the tube to pass through the sediment with little resistance. These samples allow us to estimate the frequency of prevailing environmental conditions at the seafloor. Grain size analyses of the sediment cores provide insight into the magnitude of water currents. We can assess how fast sediment accumulates, and understand how quickly the seafloor changes. We estimate recent sediment accumulation rates using a naturally occurring radioactive isotope of lead (210Pb) which is used for sediments that have accumulated over the last 100 years. Longer-term accumulation rates are estimated using a naturally occurring radio-isotope of carbon (14C), which can be used to date sediments back to 50,000 years ago. Finally, we extract water samples from the cores. Changes in the chemistry of these waters over the depth within the core can provide information about water and gas flowing up through the seafloor. Is this process the culprit for the formation of the numerous pockmarks found in this area or is another process responsible for their formation? Hopefully, samples collected in this cruise will help us to reach the answer. Today we recovered a mooring that has been gathering information about this site since September 2018. The mooring is equipped with a current meter that measures a vertical profile of bottom currents every 30 seconds. There is also a sediment trap eight meters above the seafloor used to capture sediment and organic material as it settles down through the water column (https://www.mbari.org/seafloor_expedition_2018/). To recover the mooring, we sent an acoustic signal that activated a mechanical release at the base of the mooring and triggered the device to float to the surface. After recovering the instruments and downloading the data, we put a new collecting tube in the sediment trap and redeployed the mooring in the same location. In nine months, we will be back to recover the mooring. The current meter data and sediment trap samples continue to add pieces to the puzzle of what produces the morphologies we see on the seafloor. Time-lapse video of a mooring deployment offshore Morro Bay, California. Off the coast of central California, there are more than 10,000 depressions, 10 meters (33 feet) deep, known as pockmarks. We do not know how these large depressions were formed, however, we do know they never overlap, are beautifully circular, and roughly 100 meters in diameter. 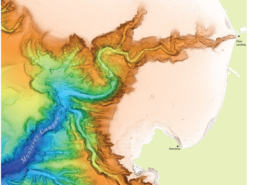 MBARI’s detailed mapping surveys conducted in 2018 show that the pockmark depressions migrate southeast over time. Pockmark depressions are commonly thought to be associated with water or gas venting, but previous MBARI studies show no evidence for this. Evidence suggests that the water inside and outside of the pockmarks is indistinguishable and contains no methane, the only common sediment gas. We are now back at the same site to investigate how these pockmark depressions were formed. We want to know if the water currents are similar inside and outside of the pockmark depressions. For example, are there swirling eddies inside the pockmark depressions which inhibit sediment accumulation? 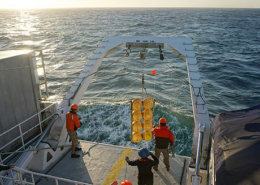 To test this, we worked with MBARI’s mechanical engineers and remotely operated vehicle (ROV) pilots to create two Benthic Instrument Packages (BIPs). The BIP’s trawl-resistant housing holds a suite of oceanographic sensors. One sensor detects oscillations in the water temperature, allowing scientists to compare conditions inside and outside the pockmarks. Two upward-looking current meters at five and 65 meters water depth vertically capture overlapping conditions in the water column. Once data collection is complete, researchers use an acoustic beacon to relocate and recover the instrument. This morning we launched two BIPs—one inside a pockmark depression and one outside a pockmark depression. In November we will recover the instruments and analyze the data they have recorded to better understand what processes are creating these unique and mysterious seafloor features.